Learn how to make your own natural cleaning, washing, hygiene (toothpaste, mouthwash), and bathing products. This will save thousands of dollars over the course of the years. Many natural cleaning agents are multi-purpose items, making them even more of a bargain, like corn starch, distilled white vinegar, apple cider vinegar, and rubbing alcohol. 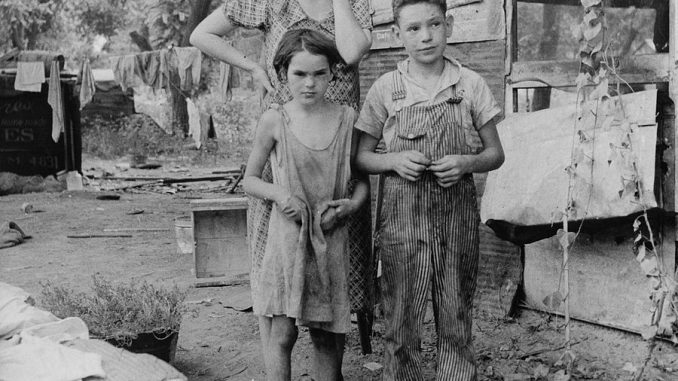 Start making these small changes inspired from the Great Depression today. Once you see the results in savings and stockpiling, making larger ones will not feel as daunting but an exciting preposition that will allow you to sleep more soundly at night. LOL!! Funny How I/Family Ate Like This as A Kid. I Made the SAME Meals AND BUDGET As An Adult. And For My Kids/Family….AND We Were All Healthy IN The 1930’s TO MID 1990’s Then THE FAST FOODS, TECH, WIFI, CELL PHONES FAST FAST FAST Way Of Living Started…AS WELL AS MONSANTO….And People Are Less Healthy. And Get Sicker…..